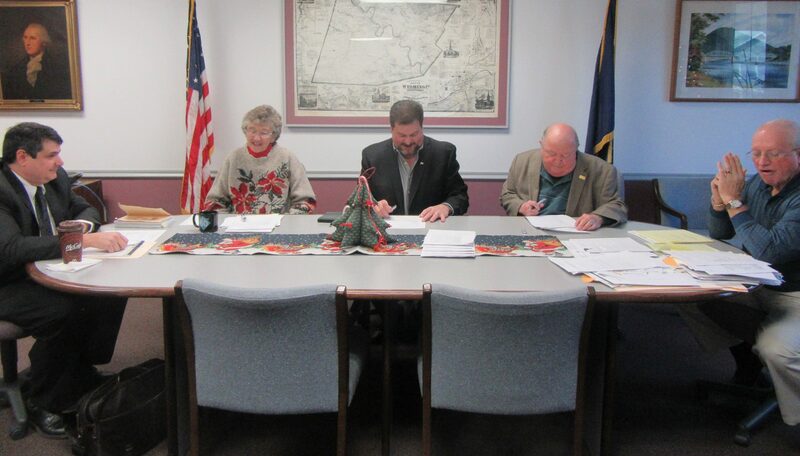 The Wyoming County Commissioners met on Tuesday to accept a budget and approve contracts that will take the county through 2017. County residents will see some new faces in the coming year and notice other committee and staff changes. Wyoming County’s new $14,832,399 budget includes a 2.75 percent across-the-board cost of living allowance (COLA) for county employees and was accomplished without a need to increase taxes on county residents. 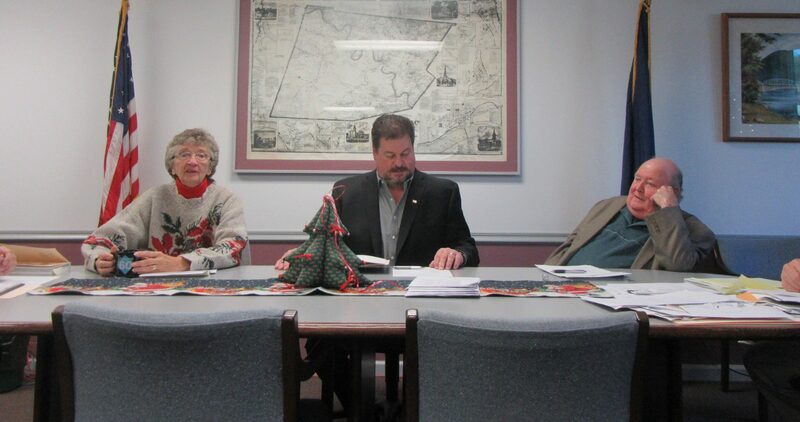 After availing the budget to the public for several weeks for review, the Wyoming County commissioners unanimously approved the budget on Dec. 27 and thanked county chief clerk Bill Gaylord for making it work. “It was rough,” said Commissioner Judy Mead. “But there’s no tax increase,” declared Commissioner Ron Williams. The salary increase affects all county agency employees, courthouse staff, EMS workers, prison employees, and non-collective bargaining staff, each group covered under a separate contract. Subsequently, the commissioners approved a management contract for the latter group that included the same pay hike but reduced the number of vacation days that can be carried into a new year from 15 to 10. County tax collectors have requested a per-parcel increase in their fees that was denied, though their stipend for supplies was increased nominally. Commissioner Tom Henry explained that the fees for tax collectors was already comparable to those in adjacent counties and across the state and did not need to raised. In other year-end business, the commissioners approved a $1.9 million TAN quote, which represents the estimated amount of money the county will need to borrow to keep county business running until tax revenues catch up. Gaylord noted that this marks the first increase in a number of years and is up about $200,000 over the amount borrowed in 2016. “That’s still well below what the county can borrow,” said Gaylord. The commissioners approved a motion to borrow the funds from Peoples Security Bank, which offered the lowest interest rate – .88 percent – out of five submitted. “We moved some of our accounts there, so that is probably why they are giving us the good rate,” Williams related. Several new hires and appointments were on the agenda, including the appointment of Lions Club president Richard Macialek to the Solid Waste Advisory Committee. Williams noted that the committee’s bylaws require the inclusion of a member of a civic group, and Henry added that the committee already has a working relationship with the Lions Club. Randy Ehrenzeller and Dale Brown were reappointed to four-year terms on the county’s Planning Commission. Two vacancies remain on the board, and Henry indicated that the county has some people in mind to fill them. The commissioners were especially happy to announce the hiring of Mike Donahue as the county’s new Children & Youth and Human Services director. Donahue is from Wyoming County and has most recently worked in Luzerne County in human services and the drug and alcohol program. Williams noted that Donahue has more than 30 years of experience. “He has always wanted to get back up here to see what he can do in his own county,” Mead remarked. “We’re looking forward to working with him,” said Henry, who explained that Donahue would also be working with the Area Agency on the Aging and assisting with mental health services and drug and alcohol programs. Donahue was a key speaker at the Not One More in Wyoming County addiction awareness rally that was held on the courthouse lawn in August. It was noted that Sheriff Ed Sherman has requested the hiring of a part time deputy sheriff. Chief Deputy Nick Root has been out on medical leave, and Paul Graham is the current “acting” chief deputy. The commissioners noted that Paul Henn is being considered for the position and approved the request. It was with regret that the commissioners accepted the resignation of Walt Derhammer from the Planning Commission. “We were surprised,” Henry said of receiving Derhammer’s letter. “He was an exceptional member of that commission,” Williams attested. Derhammer has served on the Planning Commission for 31 years. The commissioners decided that a more public farewell to Derhammer should be arranged in light of his dedication to the county. The next public meeting of the Wyoming County Commissioners will be held at the courthouse in Tunkhannock on Tuesday, Jan. 10, 2017. Read more about today’s meeting at “County Receives Grant, Bestows Others” at www.endlessmtnlifestyles.com.